Yeah, I know I am lucky. I am living life to the fullest, born as a privileged American, worked for an organization that had a defined benefit plan, kept all my fingers while refurbishing a boat, knowledgeable and bold enough to figure I can fix and maintain most issues that crop up on a boat all while exploring the world. And sometimes luck just has to hit you in the face to accept it. 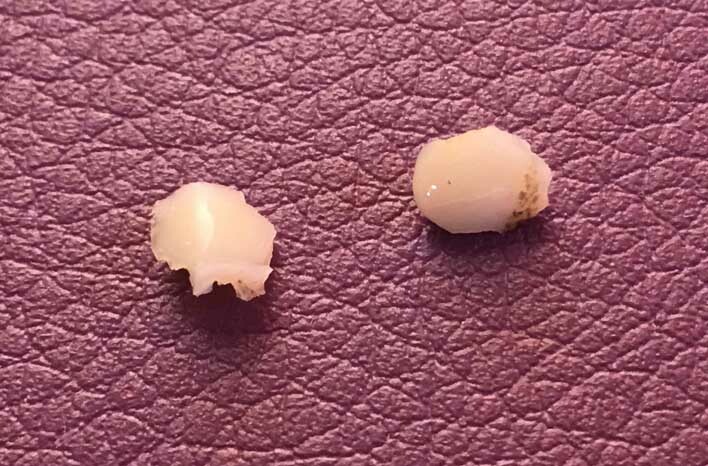 While leaving Musket Cove for the big city, Denarau, I had a chunk of my tooth fall off. I was chewing a little ice or having a small piece of chocolate and felt a little pain in my jaw. Oh-Oh. But as I continued on with the chocolate I didn’t feel any more issues. I drank some water and didn’t have any cold spots so I thought it was only a warning sign. So… I had another piece of chocolate. Oh-Oh! This wasn’t “Chunky Chocolate” but I believe there was a definite “chunk” in there. Gently I masticate until I came across the small solid piece. I removed it from my mouth and discovered a piece of my tooth. Tongue exploring I went; and yep, the piece was off a back upper molar. I was lucky, I had no pain. I was lucky, we were heading to the big city where I could find a dentist. After checking in to the marina, the first thing I wanted to know is where is a good dentist? The attendants both said Shortlane Clinic in Namaka. While we could not find a phone number for their office I did come up with an address. Monday W/ and I went to the dentist. Informed that if I arrive by 10 am I would get in to see him we made our way via public transport. From the bus stop we needed only a short walk to reach the office. There I / we waited. We had met some other cruisers whose daughter and significant other needed the same dentist and he was told to arrive around 9 ish. We waited about 2 hours and he about 5 minutes. Well, as I say “go slow” and that was the morning for us. Fortunately there was no pain and we waited patiently while at times chatting up the other patrons. By noon I was in the chair and speaking with the dentist. He agreed, a chunk of tooth had broken off. Too he didn’t feel I was yet in need of a crown for that tooth telling me to keep an open mind for the future. Approx 3/5th of the tooth will now have been repaired. He added a composite filling and sent me on my way. Perfect… and the cost…. all of $45 F. About $23 US. The rest of the day went smoothly, I was singing because I had no pain with the loss, no pain with the filling, and no pain with the cost. The following a.m. I discovered no more filling. It had fallen out. I wear a night guard to keep from grinding my teeth away and obviously the two didn’t like each other. Back to the Dentist. Luckily a cruising friend’s daughter and partner were heading back to NZ and had a ride to the airport which was passing right by the dentist’s office. I globbed on with them and by 9 ish I was back in the office awaiting the dentist. He confirmed the filling had disappeared and we couldn’t find it in the mouth guard. (W/ found it later on the counter in the head). He replaced it this time adding a Dovetail in the filling underneath, acid etched it, tucked it in, cured it with UV light and then ground it to ensure that there was no more problem with my night guard. Bingo. All done. I asked what the bill was today and he said….. get this…. NOTHING. Where can we get service like that now a days? Fiji! This entry was posted on Wednesday, July 13th, 2016 at 11:01 pm	and is filed under Medical, Places. You can follow any responses to this entry through the RSS 2.0 feed. Both comments and pings are currently closed.